A complete guide for Dead Cells. Dead Cells is a game that is quite challenging, but that is one of the factors that makes it fun! This is a game that’s all about testing player skill to the limits since after each death, you will have to start over right from the beginning. However, there are some neat tips and tricks to use that will make the game a lot easier. If there’s any such information you’re looking for about the game, then look no further because this guide is here to help you out. Rolling is your biggest lifesaver in the game! It allows you to neatly dodge incoming attacks from enemies. That’s not all though, because you can also roll right behind an enemy to deal some extra damage. You can choose to go ahead and open doors when you have to, or you can be a total badass and just break them down to stun an enemy that may be behind the door. It’s a great way to gain an advantage when entering a new room. Early on in the game, you should focus on collecting blueprints and runes in the game as these will help you progress farther into the game with each playthrough. Although the enemies apart from bosses aren’t too difficult to defeat, they can make quick work of killing you if you’re not careful. Pay attention to their attacks, and since the attacks are clearly telegraphed, time your dodges well. Keep in mind what you’ve learnt to make it easier to deal with them when you next face them. Your first instinct when you come across scrolls might be to collect as many as possible. However, as enemies grow stronger with every scroll you collect, it may be a good idea to hold off on collecting them early on so that enemies don’t deal too much damage. 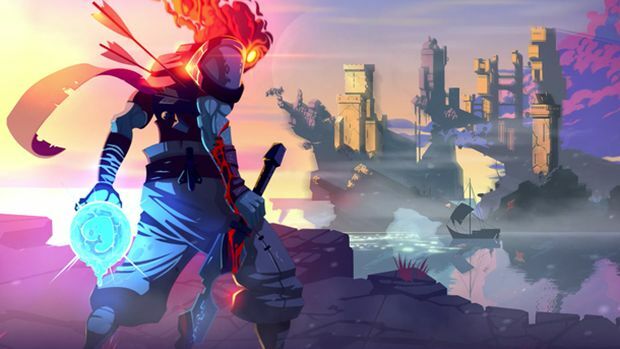 If you’re looking for where to spend your Dead Cells at the beginning of the game, there are three main upgrades you should focus on: Health flasks to increase number of times you can use health potions, Gold Reserves so you can carry more gold through each playthrough, and The Random Starter Weapons so you will start off with a different starter weapon at the start of each playthrough. You can unlock new skills to help you out in combat. To do so, you will first have to find blueprints for these skills so that you can unlock them. You can find below a list of all the skills along with the locations of their blueprints. Barnacle: This skill deals sustained damage to enemies below you. There is a 1.7% that you can find the blueprint on Thorny. Oil Grenade: Covers nearby enemies with oil and also deals damage to them. There is a 0.4% chance that you can find the blueprint on Hammer. Stun Grenade: This grenade will damage and stun nearby enemies. You can find the blueprint in the Ramparts. Corrupted Power: This skill will cause to to both receive and deal more damage. There is a 0.4% chance that you can find the blueprint on Defender. The Night Light: This skill will grant a lantern that provides light. This is not a skill that can be unlocked. Infantry Grenade: This grenade deals damage to all nearby enemies. The skill is already unlocked at the start of the game. Phaser: This skill allows you to teleport right behind an enemy and your next melee damage will deal extra damage. There is a 0.4% chance to find the blueprint on Runner. Ice Grenade: This grenade will explode and freeze enemies who are nearby. The skill is already unlocked. Wolf Trap: This skill allows you to trap an enemy for 6.5 seconds and the trapped enemy will also take extra damage. The skill is already unlocked. Double Crossb-o-matic: This skill will fire out to 2 shots at enemies. There is a 0.4% chance to find the Blueprint on Zombie. Heavy Turret: This skill will deal damage to all nearby enemies. There is a 0.4% chance to find the Blueprint on Slasher. Cleaver: Allows you to deal to all damage who walk over the cleaver and also causes them to bleed. There is a 1,7% chance to find the blueprint on Runner. Aura of Laceration: Deals damage within a small area. You can unlock the skill once you complete your 5th Daily Run. Vampirism: This skill allows you to recover HP as you deal damage. There is a 0.4% chance to find the blueprint on Inquisitor. Tornado: This skill will deal damage to all enemies within the tornado. There is a 0.4% chance to find the blueprint on Guardian Knight. Tonic: This skill heals you and also prevents you from receiving damage for the next 4 seconds. You will unlock the skill when you kill Conjunctivitis for the first time. Knife Dance: Causes bleed damage to all nearby enemies for 4 seconds. There is a 0.4% chance to find the blueprint on Bat. Wave of Denial: This skill knocks back enemies and also deals damage to them. There is a 1.7% to find the blueprint on Bombardier. Cluster Grenade: This skill will send out a total of 6 grenades which will damage all enemies in the area. There is a 1.7% chance to find the blueprint on Slasher. Grappling Hook: This skill pulls enemies close to you and your next attack will deal extra damage. There is a 0.4% chance to find the blueprint on Catcher. Explosive Decoy: Places a decoy while you go invisible for 2 seconds and after that, the decoy will explode and deal damage to all nearby enemies. There is a 0.4% chance to find the blueprint on Defender. Magnetic Grenade: Draws enemies close and then deals damage to them. There is a o.4% chance to find the blueprint on Grenadier. Root Grenade: Immobilizes enemies nearby and then deals damage to them. You can find the blueprint behind the timed door. Crusher: Crushes all enemies within the area of effect. There is a 0.4% chance to find the blueprint on Spinner. Heavy Grenade: Deals damage to all enemies within the area of effect. There is a 10% chance to find the blueprint on Bombardier. Fire Grenade: Damages nearby enemies and causes them to take burn damage for 3 seconds. There is a 1.7% chance to find the blueprint on Grenadier. Swarm: This skill will summon small creatures that aid you in battle. There is a 0.4% chance to find the blueprint on Disgusting Worm. Toxic Cloud: This skill summons a toxic cloud that deals damage for 4 seconds. There is a 0.4% chance to find this on Zombie in Purulent Graveyard. The Runes in the game are one of the most important aspects of the game. Runes are basically permanent upgrades that you will be able to retain even through your next playthrough after a death. These will allow you to access new paths that you couldn’t do so before. You can find below the locations of all four Runes in the game. Vine Rune: This is the first rune you can find in the game. Ever notice the plants on the ground that don’t seem to do anything? Well, once you get the Vine Rune you will be able to interact with these clumps and they will extend into vines that you can climb upon to access new paths. You will be able to find this rune just after you break out of prison. The rune will appear as a large stone and you will have to beat quite a tough enemy and after that, you will be able to keep the rune. Teleportation Rune: This is a rune that allows you to teleport from the standing coffins that you will find in random areas. You can find the rune by going from the prison to the Toxic Sewers using vines now that you have the Vine Rune. You will have to beat an elite enemy and once you do, the rune is yours. Ram Rune: This rune will allow you to open up new paths by ramming through walls or floors that have glowing runes in them. To find this rune, you will have to first reach the Promenade of the Condemned and at the end of it you will find an elevator that goes up to the Ramparts. Ignore the elevator and walk ahead and you will come across a standing coffin which you can use to teleport to the Ossuary. You will be able to find the Ram Rune here and you will get to keep it once you defeat the elite enemy guarding it. Go to The Insufferable Crypt and you will have to beat a boss there. You will then be able to get to the Slumbering Sanctuary. You will find an elite enemy guarding this final rune and once you defeat the enemy, the rune is yours! There are four main bosses in the game and defeating them without losing any health at all will allow you to earn some trophies! In general, it would be best to have a weapon such as the Ice Bow which can freeze enemies, and also some turrets that will be able to deal damage to bosses and deal with their minions. You can find below a list of all of the bosses along with information regarding how to beat them. The Concierge: It’s quite easy to avoid this boss’ attacks. Your best bet would be to try and running from one end of the room to the other and let your turret keep dealing damage. You will have to watch out for the boss’ aura as well. If you freeze the boss at the right time, then you will be able to complete this fight without taking a single hit. You can cheese this fight if you are lucky and are able to stun-lock him in a way that he will be stuck in one of his roars. You can check out the video below to see how exactly to defeat this boss. The Time Keeper: Just go in with a turret and a ranged weapon and make sure the turret does elemental damage and also have some way to freeze the boss. You can use the turret to hold the boss’ attention while you deal damage from a range. You can also freeze the boss to slow her attacks down and to increase your damage dealt. It’s not too difficult to avoid all of the boss’ different attacks, so you will be able to survive without losing health. You can make this fight significantly easier just by using an ice bow and freezing her while also using turrets to deal damage. You can check out the video to see how to beat this boss. Conjunctivitis: This boss will bring out some minions so you will need to use turrets to take these out first. In this fight, you will have to deal most of the damage to the boss, so let your turrets do their work and then focus on dealing as much damage as possible to the boss. You can check out the video below to see how to defeat this boss. The Hand Of The King: This is the final boss fight and it’s quite a tough challenge. The best strategy with this boss is basically to use turrets and freezing attacks to slow him down. Wait for when he summons the War Banners because he’ll leave himself open at this point which will allow you to slow him down with ease. You can check out the video below to see how to defeat this boss. Combat in this game can be challenging, and it’s all the more harder because of the permadeath mechanic in the game. However, there are a few things to keep in mind that will help you have an easier time in the game. The first thing to keep in mind is that you will have to stay focused at all times since any moment can suddenly be your last in the game. With every death, try and learn how to avoid such deaths in the future and think ahead before getting into fights. Try to learn enemy patterns of attack. Enemy attacks are clearly telegraphed, so you will be able to deal with them by just being careful and patient. Try and diversify your style of playing, and try and get used to using different kinds of weapons so that you will be able to deal with whatever challenge comes your way. Also, rolling and stomping are abilities that you should feel free to overuse as they have a great effect in combat. There are four different Keys to find in the game and they’re very difficult to find! These keys can lead to some treasure or the other but it’s up to you decide whether the reward is worth it. You can find below a list of the different keys along with information on how to find each of them. Architect’s Key: To find this key, start looking for a secret in the walls when you’re opening the path to the underground part of the graveyard. Once you find the secret, you will get the key and this key will open a gate and you will be able to access a path that leads to a blueprint. Clockwork Key: To unlock the Clockwork Key, you will have to ring the bells in an order ranging from softest to loudest. This is not quite an easy task since the bells are all far apart and there are quite a lot of them, and it’s not easy to keep in mind how loud each one is as you go around ringing different bells. Gardener Keys: There are three different keys to collect here. You can find one of them by using the Spider Rune and solving the jumping puzzle. You can get another one of the keys by using the Ram Rune to break through the floor . The final key can be found in the middle of the map by slamming a flower that looks like the keys. You can check out the video below to see how to get all of the keys. Moonflower Keys: To get started on this, first unlock the third boss stem difficulty, obtain all of the Garden keys and then head to the Ramparts. You will be able to find the first key somewhere and you will have to fight some bosses to exit. After the boss fights, you will be able to go to the Graveyard and get the second key. The next step is to go to the Forgotten Sepulcher and you will be able to find the third key here. Now, beat the boss and then go on to the area where there will be three doors which you will need the Moonflower keys to unlock. This is a game in which difficulty is one of the most important parts of it. However, if you just want to see the sights or want experience the game on your own terms, then there are cheats you can use to make things easier overall. You can find below the full list of achievements you can earn in the game. A Room With A View: Reach the Ramparts for the first time. High Drama: Reach the Clock Room for the first time. Please Leave Your Shoes At The Entrance: Reach the Castle for the first time. Tic… Toc…: Reach the Clock Tower for the first time. Flawless Victory: You beat “Conjunctivitis” without taking a single hit. The Last Rampart Falls…: Beat the Hand of the King. Masterful Extraction: Absorb your second Boss Stem Cell. Harder Better Faster Stronger: Finish the game with three Boss Stem Cells active. Even The Rats Avoid The Place: Reach the Insufferable Crypt for the first time. Up, Guards, And At Them Again! : Finish the game with a Boss Stem Cell active. Slash! Slash! Roll! : Unlock 10 weapons. Steam Rolled: You b eat “The Concierge” without taking a single hit. I Like To Live Dangerously…: Against all odds, you finished the game with the Cursed Sword! Do you need… A hand?? Bahaha! : Beat the Hand of the King without taking a single hit. Surgical Extraction: Absorb your first Boss Stem Cell. The Fat And The Furious: You beat “The Concierge”! We’ve All been There Before…: A downward smash attack… right into some deadly spikes! See, that wasn’t so hard now, was it? : Successfully complete a Challenge Rift. Here comes a new challenger! : Absorb the Challenger Rune! Fortune and glory, kid. Fortune and Glory…: Reach the Slumbering Sanctuary for the first time! Smells like burned flesh: Reach the Ossuary for the first time. Love the serenity…: Reach the Promenade of the Condemned for the first time. It rubs the lotion on its skin! : Reach the Prison Depths for the first time. Bend the knee? I think not…: Reach the Guardian’s Haven for the first time. La Brute: Absorb the Ram’s Rune. Never Fallen: Finish the game with “Ygdar Orus Li Ox” in your possesion! Faster Than Light: You finished a daily challenge. Well done! ¡Arriba, arriba! ¡Ándale, ándale! : Open your first timed door. What are you rubbing at anyway? : Absorb the Teleportation rune. “My only wish, to catch a fish…”: Reach the Stilt Village for the first time. What’s that funky smell? : Reach the Toxic Sewers for the first time. Ohhhhhh! That hurt! : Die while carrying at least 100 cells. Burn. What? There’s nothing wrong with these…: Finish the game with the starter sword, bow or shield. Not So Tough: You slayed 100 elites. Badman. Is there something in your eye? : You beat “Conjunctivius”! Shrewd Sleuth: Find your first secret zone. Incy Wincy…: Absorb the Spider’s Rune. Quit Tickling! : Absorb the Vine Rune. Afraid of the dark? : Reach the Forgotten Sepulcher for the first time! The dead center of the island…: Reach the Graveyard for the first time. Who needs an Italian plumber? : Reach the Ancient Sewers for the first time. Finally, a moment of rest…: Reach the Black Bridge for the first time. They came from behind! : Suicide by elevator. Blade Master: You have beaten the “Time Keeper”!